For the first time this year, instead of talking about how nice it would be, we actually made it to a screening of a film at Dubai International Film Festival. Our chosen film was Champ of the Camp. I have been reading about the film in the local press for some time, and had begun to doubt that it would ever be released, due to the fact that the treatment of the labourers who are basically responsible for making the enormous construction boom possible in Dubai, the UAE and the wider Gulf, is a fairly sore point as it has been the subject of such international criticism. 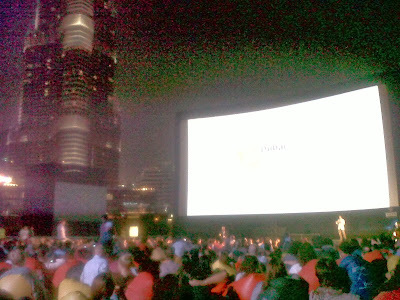 It is impressive that the director and producer managed to get it not only released, but screened at the the Emirate's film festival, and, at a 1,000 seat open air event right next to the Burj Khalifa, one of Dubai's best-known symbol of audacious wealth and determination to be the biggest and the best. Please excuse the poor quality pic, I forgot to take my camera with me so it is from the Crackberry, but this gives a little sense of the atmosphere. Champ of the Camp tells the story of a singing contest that is held during the summer months at the labour camps where the construction workers live. The men audition to compete in a Bollywood singing game show, held in camps across the country, where singing ability and encyclopaedic memory of the thousands of songs written for the Indian film industry are key to being crowned Champ of the Camp. The winner in 2012 received a cash prize and an enormous flat screen TV. What is the true heart of the film, though, is the lives of the men and the solace the simple act of singing a romantic song from a Bollywood movie can bring to them, while they are thousands of miles from home, working long hours in searing heat for small salaries with often little prospect of seeing their loved ones for years at a stretch. I can't remember ever before being so excited to see a film, or so pleased that it had actually been screened here. The screening itself reminded me of one of the central scenes in Cinema Paradiso, when the residents of the town gather in the square to watch the movie projected on to the wall because their beloved cinema is closed. OK, it was a lot more official and high-tech than that, but the sound system was such that the singing of the men echoed from the speakers and the sound bounced off the Burj Khalifa, which one of the subjects of the film had been involved in building. The divisions between the lives of tourists and richer local and ex-pat residents in Dubai is such that he had never before been back to actually see the building as a visitor. A trip with the film makers was the first time he had ever got close up to simply stand back and look at it and watch the Dubai Fountain in the adjacent Burj Lake. It may have been a happy accident, but the point in the film when the fountain was shown was the exact point when the real life fountain behind it started to do its watery and flashing light stuff, another coup, even if it was not deliberate. There are several scenes where the film makers simply train their cameras on individual workers standing in certain Dubai spots, beaches, building sites, near the Burj Al Arab, and they sing their hearts out. It is moving to see these songs, often ballads for lost or longed for loved ones, in such a different context, away from the glitz, the glamour and the frenetic dancing of Bollywood. I challenge anyone not to fill up at the sight of one contestant sobbing at the thought of being so far away from home and unable to be there in the event that something should happen to his aging parents. It is pretty sobering for a privileged ex-pat like me, who walks past hundreds of these workers on a daily basis, toiling away in 40+degrees, without really giving much thought to what their lives must be like. There was only one slightly jarring moment in the film, that did not seem to quite fit, where two workers had a discussion about why one worker, from Pakistan, should happen to know songs from Bollywood, which felt as if it had been rather staged, and in my view, was completely unnecessary as there was plenty of other context to explain the use of Bollywood songs. Other than that, I cannot really begin to stress how impressive this film is, how fascinating an insight it is, the sheer quantity of work that must have gone on behind the scenes to navigate UAE bureaucracy to obtain permissions to film. Much was made in media interviews with the director in the run up to the screening about how the media had previously only given a very small insight into the poor conditions inside the camps, the implication being that there is a much bigger pictures and it is not all bad. Well, his film showed conditions of eight men sleeping in bunks in one room, lack of air con in cooking facilities (no joke in the summer when it is 50degrees) and men disclosing that they receive a salary of Dhs1,000 per month (just over 166pounds). The fact that Mahmoud Kaabour was able to show this is pretty miraculous and I have already decided if I ever need to get something really very tricky done in Dubai, it is Mr Kaabour and producer Eva Sayre that I will be asking! The winner of the contest, the film revealed, returned to his home country for a short while because his contract expired, and has since relocated to Saudi Arabia. Another, from Bangladesh, had actually been in the UAE illegally having overstayed his visa, but also managed to return home thanks to a visa amnesty last year. Another is back in Pakistan. Four of them attended the screening and each sang a song for the audience afterwards, their voices once again bouncing off the Burj Khalifa. During a post screening interview, what really struck me was how one of them said that he never thought "people of such calibre" (ie rich and privileged people) would come to watch the film. Growing up in a society like the UK where one is taught that everyone is equal, no one is "better" than anyone else, whether or not their parents own land or have a lot of money or whether or not they have a brown or white skin, I always find such things upsetting to hear. Imagine, thinking the place where you were born or your parents' lack of money means you are not "of the same calibre" as others. I just can't, yet this is clearly how some of these men who are building the skyscrapers that are always springing up around us feel. Everyone should try to imagine what that feels like to appreciate what they have, and, that is why everyone should see Champ of the Camp. Now the real test will be to see whether the film will reach a wider audience and whether it will be the cause of any improvements in the lives of the men.